One of the best parts of being a beauty blogger is getting to find out about new brands that you’ve not heard of before. So when I was asked if I would like try some nail products from Microcell I jumped at the chance. This brand is very popular in Germany but is only just being introduced to the UK. It offers nail repair products that are calcium and seaweed infused along with acetone-free removers, professional and safe files, at-home gel polishes (no lamp needed) and the first nail colours to repair your nails as you wear them. I tried the products out on my very poorly nails. (They’ve suffered from the cold weather and my being a bit run down after a bout of flu.) I started with the Mineral Nail File. 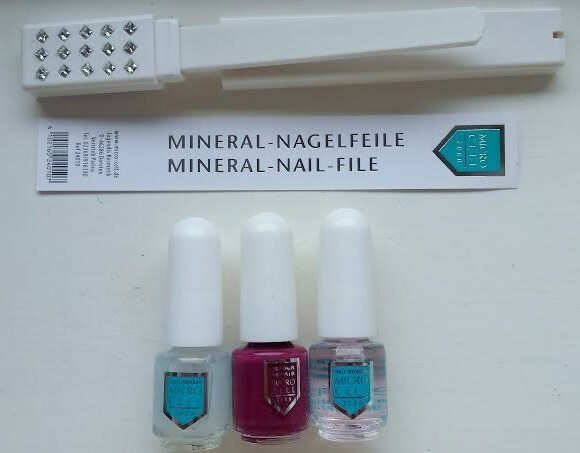 I didn’t really understand the value of using this type of file before but I read that “Micro fine minerals fill the tiniest cracks on nails and seal rough, brittle nail edges. This prevents moisture from penetrating them, stops further damage to the nails, and even allows rough varnished nails to be smoothed without damaging the varnish near the edges.” All that benefit just from the nail file. This was beginning to look interesting! Next I used the Nail Repair as a base coat. This promises beautiful strong nails in 2-3 weeks. It strengthens nails and protects the tips against tearing and splintering. Then I applied the fun bit which was the gorgeous Colour Repair polish. It went on smoothly and was opaque in one coat. I put on two coats out of habit. This unique nail beauty solution is the first quick-drying varnish which also strengthens the nails. It’s enriched with silicon, calcium, green alga and a unique Diamond-Gloss. As clear varnish Nail Wonder protects against aggressive external influences and gives the nails a brilliant shine. What did I think. Well I’m pretty rubbish at applying nail products but this range made it easy. It dried to a great shine and guess what I wore it for 5 days before it chipped! I can’t say that about any product I’ve used before. Just love it! Would like to see a bigger colour range but I’m sure they’re working on that. These products were gifted to me for review but the opinions are my own and were not prescribed.